Thanks for weighing in with your comments about the Wollmeise sock yarn. Some of you agreed that you found it a little splitty and that it tended to kink up on itself, and some of you didn’t have that experience. I think this might have something to do with how we knit. I tend not to look at the stitches while I knit, so if I’m knitting with a yarn of many plies, it sort of makes sense that there’s a bigger chance of my splitting the yarn. For the Wollmeise, I compensated by looking at my knitting a lot more often, and I was able to correct all the splits that occurred. 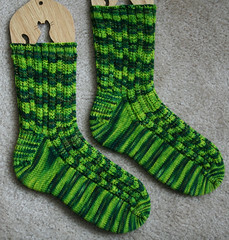 And the Frog Warts Socks, they are done. I really love them, and I have no regrets about the yarn — it’s so pretty knitted up, don’t you think? It’s just a little more high maintenance than some sock yarns. 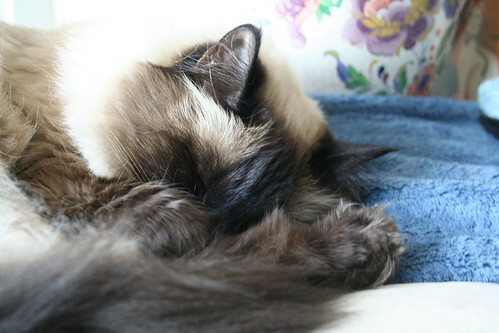 But there is room in my life for a high maintenance yarn from time to time if I get end results like this. 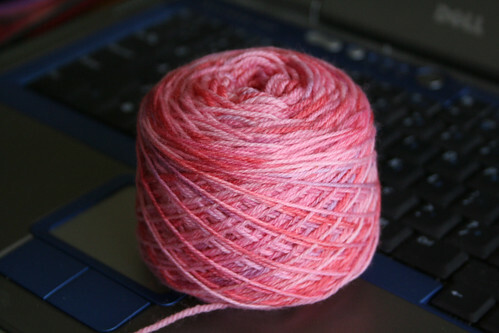 I would be interested in what your favorite sock yarns are (say, top five). There are so many special, “boutique” yarns out there, I don’t know where to start. 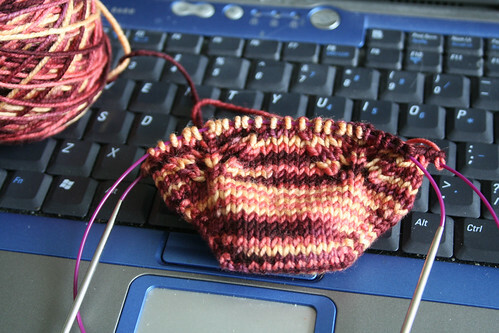 When I first started knitting socks a few years ago I was drawn to the self-striping sock yarns because they seemed so cool. I was a huge fan of Opal self-striping yarn. I still am very fond of Opal — it makes great guy socks, I think, because it wears so well. And I actually just bought a skein of Opal handpainted a week or so ago. Lately I’ve been sampling sock yarns from a whole lot of different dyers. So far in the Summer of Socks I’ve knitted with yarns from The Knittery, All Things Heather, Blue Moon Fiber Arts, Lime & Violet, Sock Pixie, Classic Elite, Dream in Color, and Fiesta. And I’ve loved them all. Colorway “Cool Fire.” So yummy . . . So . . . what are your current sock yarn crushes? Lucy has visions of sock yarns dancing in her head! 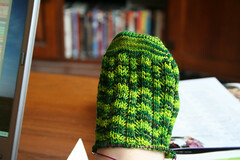 Yep, I’m using Wollmeise sock yarn for my Frog Warts Socks. 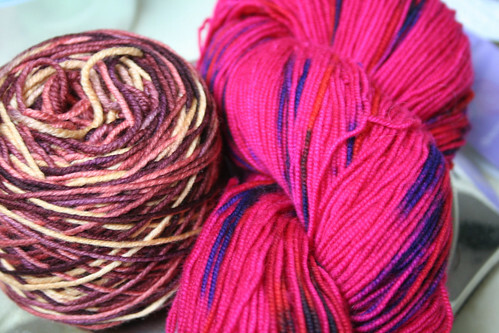 I’ve been seeing quite a hubbub over this sock yarn here and there in the blog-o-sphere for the past couple of weeks, so I was very curious to give the yarn a try. The first thing I noticed about it when winding it into balls was how soft it is not coming off the skein. In fact, it sort of feels like cotton string, not the 100% wool that it is. It reminded me of Opal sock yarn, except I think Opal is slightly softer in the skein. I started knitting with it, a toe-up sock toe, as per usual. While knitting the toe and doing the increases, I was somewhat disappointed in the yarn. 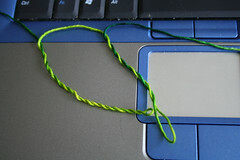 It seemed to have very little give, and I found that it was very easy to split stitches. The yarn is made up of multiple thread-like plies (I count 7 plies), and I had to remain vigilant to keep all those little plies in line. 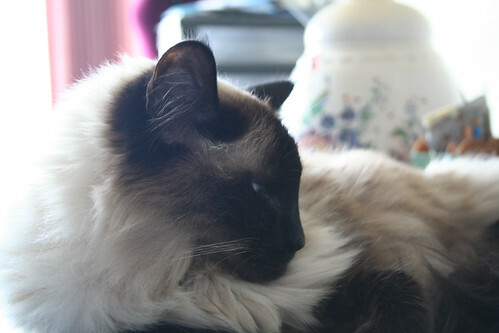 Another annoyance — the yarn has a tendency to kink up on itself rather badly, which slows down knitting. Once I got past the toe and the every-other-row increases, I was much happier and started to relax and enjoy knitting the yarn. As I mentioned yesterday, the dyeing is lovely. It also has wonderful stitch definition and the knitted fabric is very elastic and nice, even though I think the yarn itself has a somewhat stringy feel. I understand too that it will soften up nicely when it is washed. I’ve got one other skein of Wollmeise, and I might wash this skein before knitting it, just to see if it makes any difference. But then again, I might not. I like to live on the edge, you know? I’d be interested in hearing about the experience and perceptions of people who have knitted with this yarn. Do you agree with my findings or am I being overly picky? A couple of you have asked if I have ordered Wollmeise directly from Germany — I have not. My Wollmeise came from The Loopy Ewe. 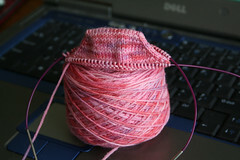 Here is the state of my second Frog Warts Sock. 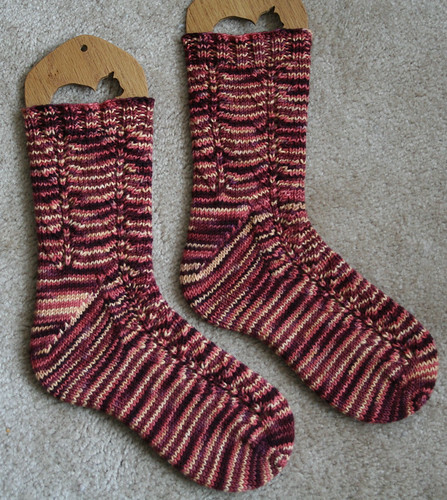 The Southwestern Socks pattern is now available as a free download from The Loopy Ewe’s Free Patterns Page. I hope you enjoy it! 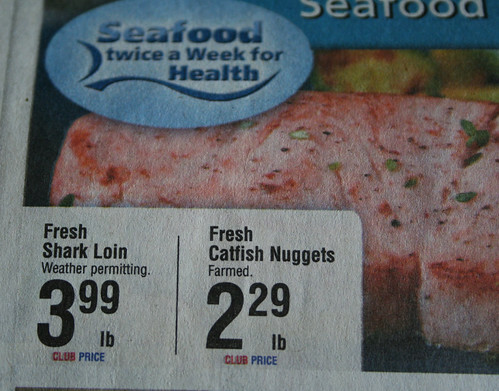 I’m not sure what the weather has to do with it, but as it is rainy today, I guess I can’t count on getting any shark loin, eh? 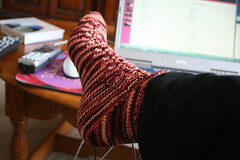 Here they are: completed Southwestern Socks. 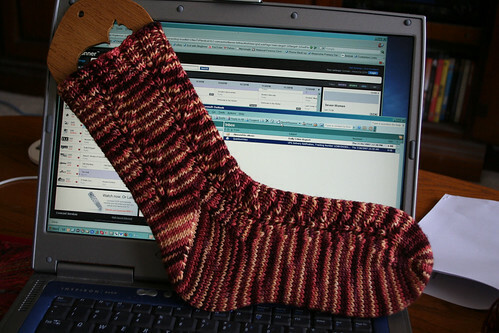 So of course another sock hopped onto the needles. 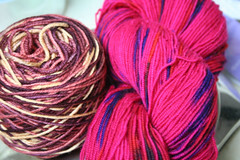 I broke out a skein of Wollmeise in the Lowenzahn colorway (acquired from The Loopy Ewe of course). Don’t it make a purty toe? I’m knitting this on 2mm needles and getting 8 stitches to the inch, and working a simple lace pattern. I love the fabric it makes and I love the dyeing on this yarn. And lo and behold! 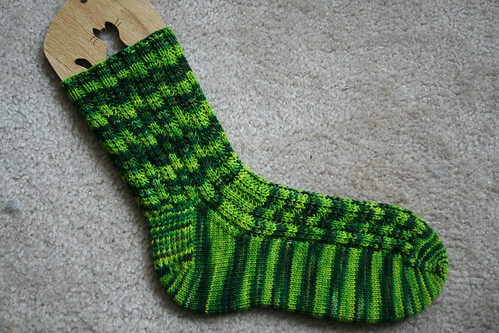 I got the first sock completed today. If you end the Summer of Socks with X pairs of socks and Y single socks, does that count as X + Y/2 pairs, or just X pairs and the single socks are just left lying about without being included in the count? Well . . . I think any single socks that are completed count as a half pair. But in my Summer of Socks contest, most people guessed “whole” pairs and did not concern themselves with halves, so I don’t think it matters much. 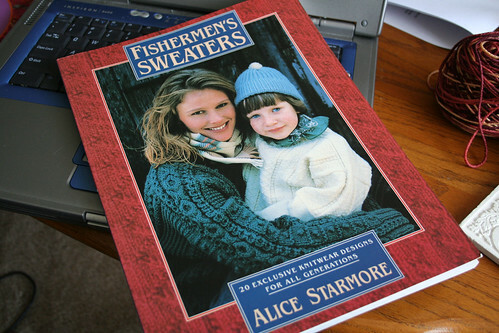 I got 465 emails entering the giveaway for the copy of Alice Starmore’s Fishermen’s Sweaters. The random number generator chose Laura S. as the lucky recipient. 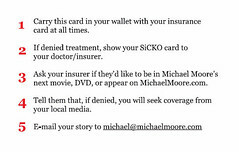 Laura, I’ve emailed you! 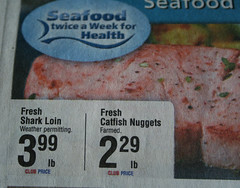 If you click on the photo to see the larger size, you ought to be able to read it. 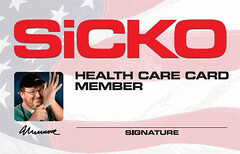 After I signed it, the KOARC thoughtfully laminated it for me. 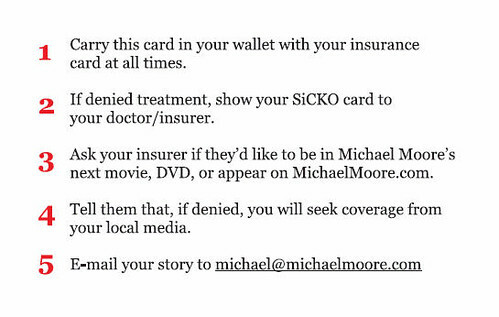 It is now in my wallet next to my health insurance cards. Just a quickie post today. But I wanted to report that I’ve got one Southwestern Sock completed. 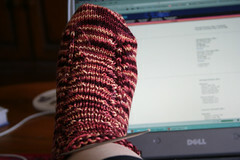 Sportweight socks knit up really fast! The Fiesta Boomerang is lovely to knit. 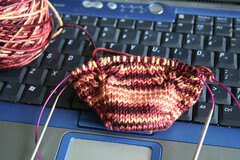 I’ve made a start on the second sock. 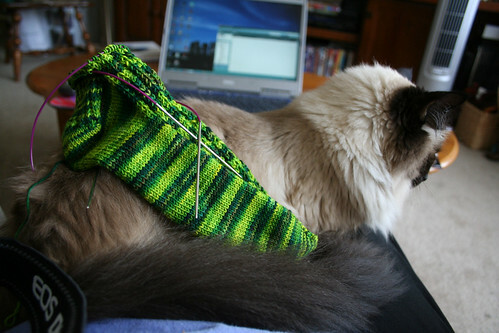 Nope, I have no plans to start knitting two socks on two circs at the same time. As was pointed out in the comments, it is not the best thing to be doing for commuter knitting. 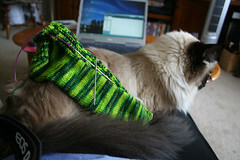 But one sock on two circs works just fine for me. 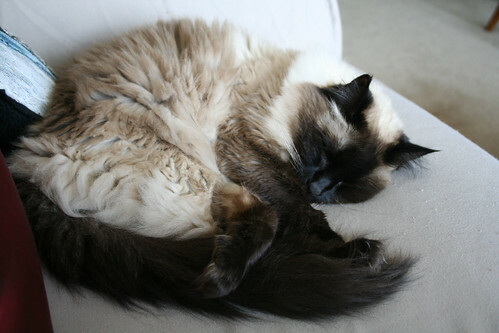 I note that some of you feel the 16″ circs are too short, but they work perfectly for me. I tried 24″ and they just seemed a bit long. 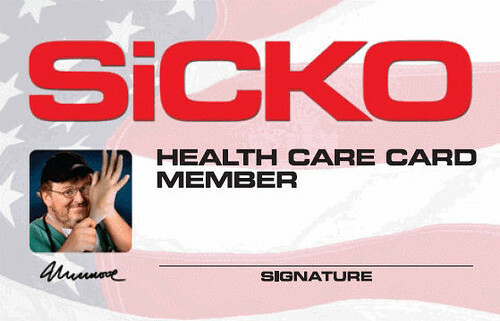 To each his/her own, eh? 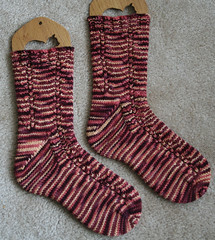 For people who are having problems visualizing how to do a sock on two circs, there is a very helpful video at KnittingHelp.com. Check out this page. Under the heading “Small Diameter Circular Knitting” there are three videos — one for dpns, one for two circulars, and one for magic loop. Speaking of magic loop, I’ve no plans to try that. But never say never. For all I know, next week I’ll give away my entire stash and start crocheting granny squares in Red Heart acrylic. Today is Thursday so it must be time for a book giveaway. This is a copy of Fisherman Sweaters, by Alice Starmore, and like last week’s giveaway, it was very generously donated by Joanne F.
Want it? Send an email to blogcontestATcomcastDOTnet before noon Eastern time on Sunday July 29, 2007. The random number generator will choose the recipient on Sunday afternoon. 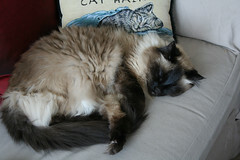 Momma can crochet with Red Heart if she likes, as long as she doesn’t interfere with my nap schedule too much. 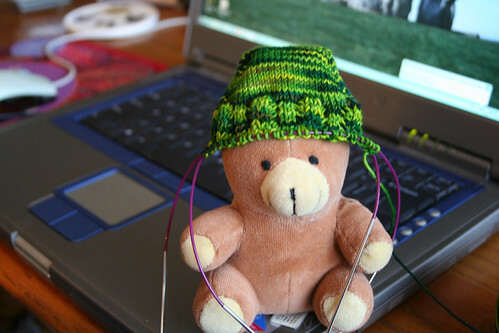 Once upon a time, if you had suggested to me that I might want to try knitting a sock on two circular needles, I would have cheerfully told you that I’d rather gouge out my own eyes with red hot Addi Turbos. Given that every last sock I have knit so far in the Summer of Socks is knit on two circulars, I think it is safe to assume that I have changed my position on socks on two circs. It was a bumpy start, though. The first attempt I made at the two circs technique was with needles with a longer cord — 32 inches. 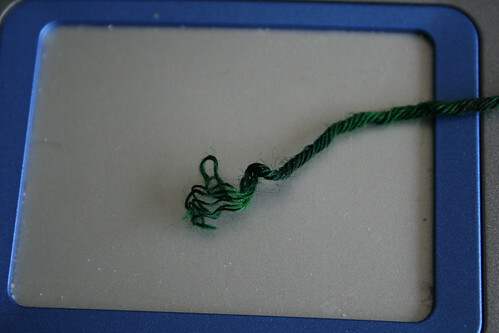 I found that I spent way too much time pulling the working needle into position and not enough time knitting. But then I discovered Knitpicks 16-inch circulars. For me, these are the ultimate sock knitting needles. The cords are short enough so that I can whip them into position very quickly, and they are flexible enough so that the short cords don’t impede my knitting progress. The tips of the needles are very nicely pointy and the needle portion is neither too long nor too short. In the parlance of the Three Bears, I pronounce them ju-u-u-ust right. 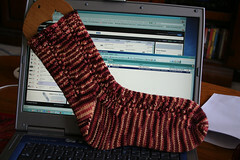 Here’s the new sock on the needles. 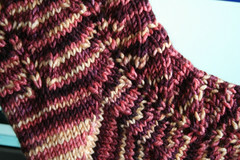 The yarn is Fiesta Boomerang, in the Mochachino colorway. I purchased it from my favorite yarn pusher, The Loopy Ewe. Knitting it on 2.75mm needles, it knits up to my sportweight gauge of 6.5 stitches and 9 rows to the inch. So it zips along very quickly. And it’s a lovely soft yarn — very pleasant to knit. 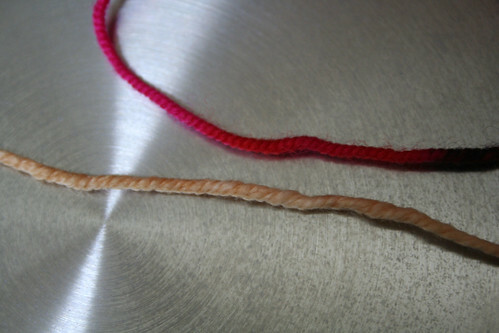 Roseann asked if it was similar to Colinette Jitterbug, so I got out the lone skein of Jitterbug that I possess (I think I should get extra credit for being able to find it quickly in the stash room), and set the two side by side. The Boomerang seems to be a much thicker yarn. The Jitterbug is the one on the top. The Jitterbug specs: 289 yards per 100g skein, gauge: 7 stitches/inch on a 3.25mm needle. The Boomerang specs: 320 yards per 5 oz skein, the gauge given is for worsted weight, which it really is, but I’m getting 6.5 stitches/inch on a 2.75mm needle. This is making a nice thick and incredibly soft sock. I can see these socks becoming favorites next winter when the weather is cold and miserable. 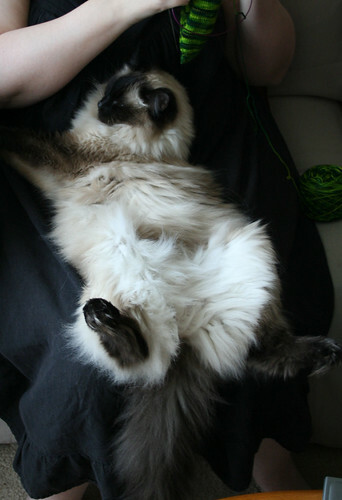 I don’t need knitted socks — I have widdle fur tassles between my widdle toesies!